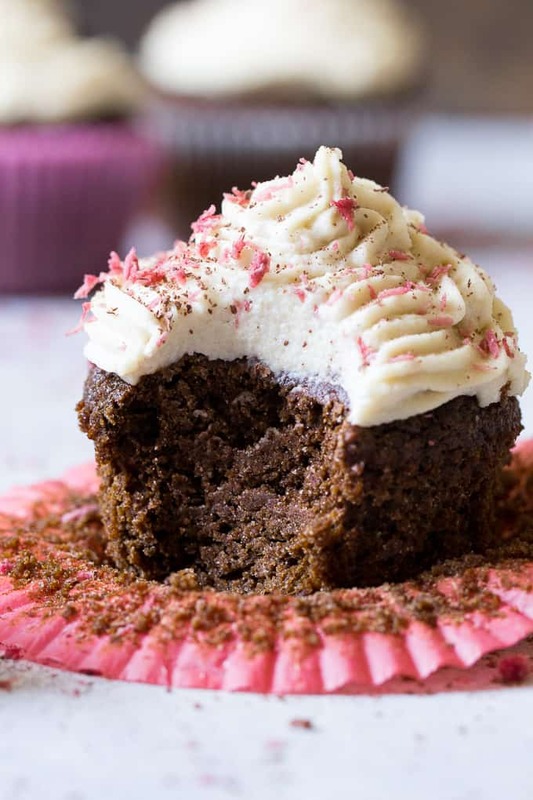 Perfect Paleo Chocolate Cupcakes (grain free, dairy free, soy free) made with coconut flour, topped with homemade coconut cashew “cream cheese” frosting and pink coconut sprinkles! It’s that time of year once again. Emily’s birthday/Valentine’s Day! Technically they’re 2 days apart, but since I’ll always remember bringing her home from the hospital in a little red-heart sweater hat on the 14th, it’s all the same in my mind. That said, I usually try to post something on the blog that’s chocolate + birthday-ish to celebrate both days. 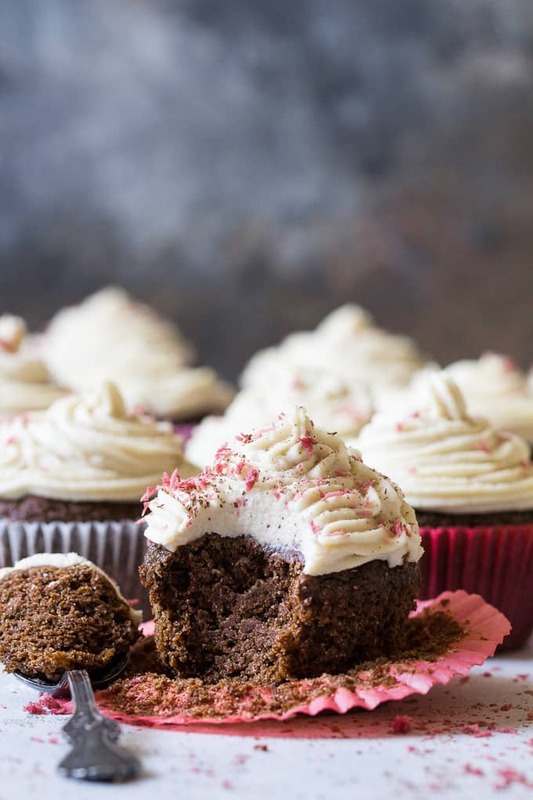 And yes, these Paleo chocolate cupcakes are the follow-up recipe to the very addicting coconut cashew cream cheese frosting recipe from Wednesday! While the frosting came together effortlessly, the cupcakes didn’t give me that same delight. Nope, they drove me crazy for 2 days straight, just as many tricky Paleo baking recipes can do. 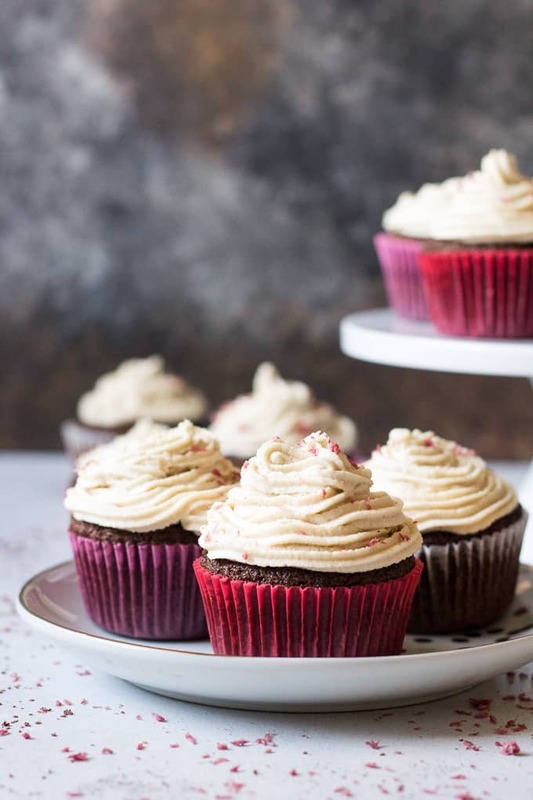 In truth, I originally wanted these – so badly – to be red velvet cupcakes. 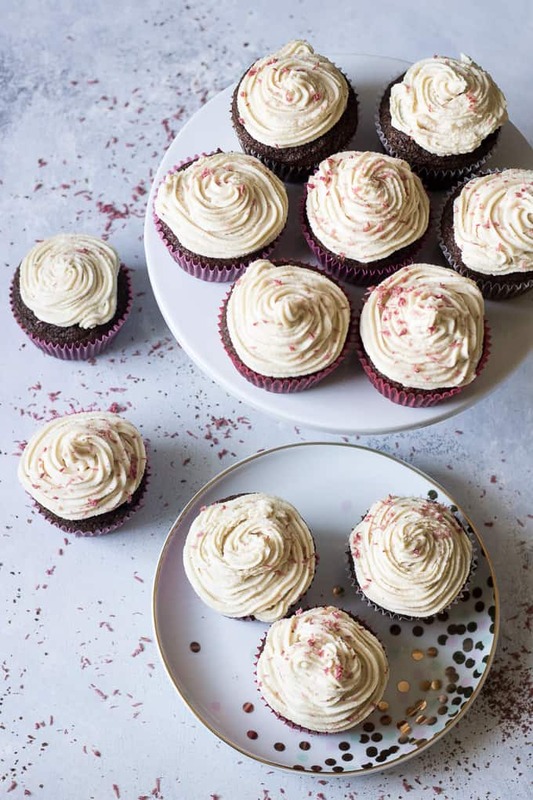 I get obsessed over recipe ideas and I was madly obsessed with making “classic” red velvet cupcakes, Paleo style, with beet powder. However, although my batter came out a beautiful deep red color, once baked, the cupcakes just looked brown. I also added too much coconut flour on that first try, which is another issue entirely, but, needless to say the first batch was all wrong all the way. 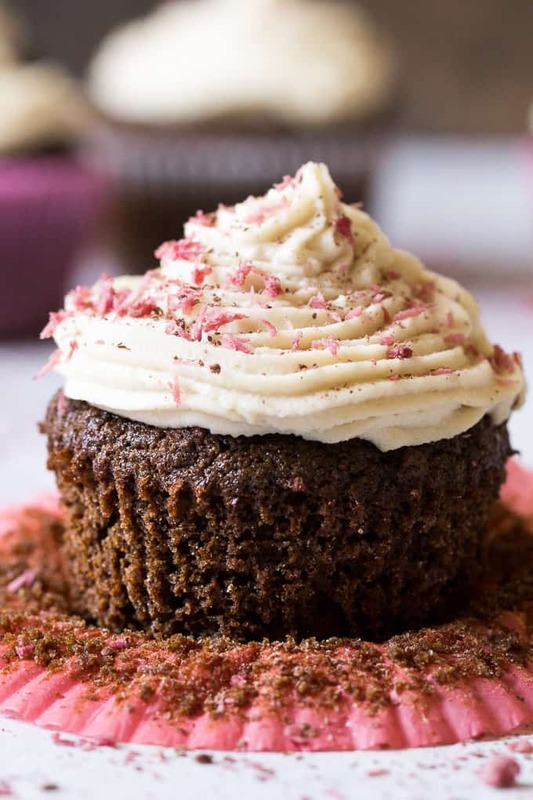 I honestly did not want to put actual roasted beets in the cupcakes, since, I suppose I wasn’t SO hooked on the red velvet idea to go as far as roasting beets and staining half of my kitchen just for reddish colored “red velvet” cupcakes. I feel that if I’m going to go as far as roasting beets, I need to actually taste the beets and put them in a salad or something, you know? Not cupcakes. So, I gave up the red velvet idea and settled for chocolate, and I’m not one bit sorry about it. I managed to stick with a coconut/tapioca flour combo (no almond flour was another challenge!) and came out with a wonderful texture and flavor that even the pickiest one of my crew liked. Even though I’d given up on red velvet, I was still thinking of ways to use my remaining beet powder. I didn’t actually want to color my frosting because I thought it had such a pretty cream color that contrasted the chocolate really well. I’d recently come across naturally colored “coconut sprinkles” and figured I’d give it a shot with my beet powder and a bit of water. Nothing to lose! So glad I tried it out because the color turned out perfectly and the kids had no idea what I’d used to color the sprinkles. So, at the end of all the recipe drama is a finished product I know you guys will love. 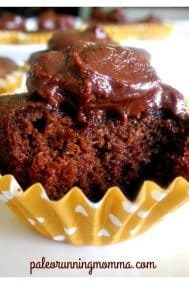 An easy Paleo chocolate cupcake that’s both soft and moist yet sturdy enough for frosting, perfectly sweet and chocolatey at the same time. If “cream cheese” frosting isn’t your thing, I HIGHLY recommend trying out the chocolate ganache I used on my vanilla cupcakes cast year. You can also frost them with a coconut whip cream frosting if you like light and fluffy. Ready to bake? Let’s get started! 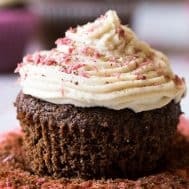 Perfect Paleo Chocolate Cupcakes (grain free, dairy free, soy free) with coconut cashew "cream cheese" frosting and pink coconut sprinkles. Preheat your oven to 350 degrees and line a 12-cup muffin pan with liners. Using an electric hand mixer, beat together eggs, coconut sugar, almond milk, coconut oil, vanilla and ACV on low speed until fully combined. Combine dry ingredients completely in a separate bowl, then add to wet ingredients and mix on low until just combined. Don't overmix. Fill 12 cupcake liners evenly, just about to the top, or 3/4 of the way since they won't rise much. Scrape the bowl with a rubber spatula to use every drop. 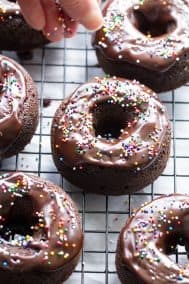 Allow to cool in pan for 2 minutes then carefully transfer to a wire rack to cool completely before frosting with the frosting of your choice - Coconut Cashew Cream Cheese Frosting or Chocolate Ganache. Mix the 1/2 cup shredded coconut with 2 tbsp water and 1 tbsp beet powder, add water if needed*, then spread out in a single layer on parchment lined baking sheet and bake at 200 until just dried, about 10 minutes. They will further dry once out of the oven. Frost cupcakes and top with sprinkles. Store leftovers covered in the refrigerator for up to 5 days. Enjoy! 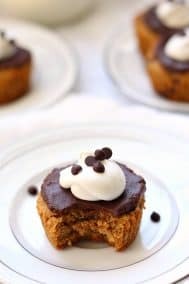 Want more Paleo cupcakes, cakes, and baking recipes? Try of of these! How stubborn are you with cooking/baking? What Valentine’s Day treats are you making this year? Slice beets with a potato peeler. Or mandolin or any slicer that makes it thin. Dry – low oven or a rack above the wood stove, which is what I have. Crush to smaller pieces then grind in coffee grinder. I take this camping all the time. Added to pancakes, makes pink pancakes! 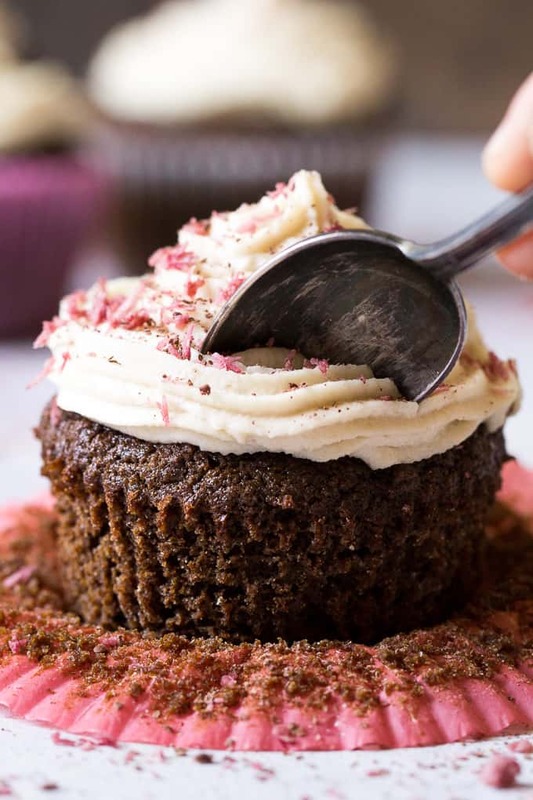 Hi – using silicone molds was probably the issue, I always used parchment liners for my muffin and cupcake recipes and have no sticking issues, the baking time/temp is usually different with silicon as well. Hope this helps! I absolutelylove this recipe. I’ve made it a couple of times tweaking it a bit to experiment with other ingredients and it turns our well every time. My family loves this cake. It’s now our family favourite, even our visitors love it. Thank you for sharing your scrumptious recipe. Hi Michele! First I must say that my family and I are huge fans of all of your recipes that I’ve tried. My husband asked me he other night after another hit meal “was this from the running momma?” 🙂 My question is, am I able to make any of your cupcakes and freeze them? (Without frosting of course). My children can’t have cupcakes at school when celebrating a friend’s birthday so each time there is a party I need to make a batch for the kids to take one for themselves. If I could just keep some in the freezer it would be a huge help for me. Thanks again for all that you do for us readers! I have recently reintroduced eggs so the entire new world of baking opened to me. The recipe is simply amazing. Simple to make and delicious. Together with the cashew frosting it’s a bomb! Thank you so much for sharing! My gluten & dairy eating friends loved them too!